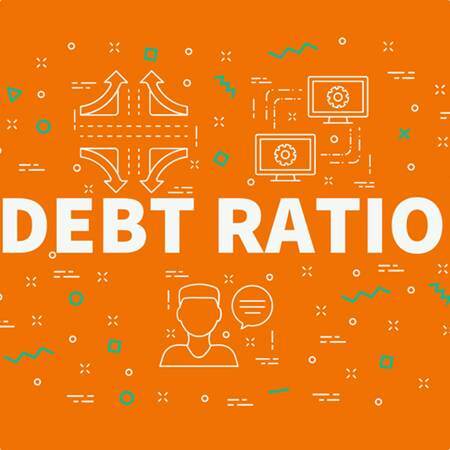 Debt ratio, also known as the debt-to-asset ratio, is one of the KPIs used to assess a company’s leverage, and indicate what percentage of the business is financed through debt. There are no hard and fast rules about what debt ratio is ‘good’, as it varies by the type of business you are looking at, but it’s a good measure of the financial stability of a business. A business with a poor debt ratio might struggle to attain finance as lenders could consider them a risk. It can also indicate that the business has problems with cash flow. How is debt-to-asset ratio calculated? Debt-to-asset ratio is calculated by dividing the total liabilities (debt) of a company by their total assets. For example, a business with liabilities of £3,000 and assets of £10,000 would have a debt ratio of 30%. If their liabilities were £4,000, it would be 40%. The higher the number you end up with, the higher the ratio – and therefore a higher degree of debt financing. Another ratio used to analyse a company’s leverage position is the debt-to-equity ratio, which compares total liabilities to shareholders’ equity. Again, a higher number means the business is using more leverage, which means they could have a higher risk of financial problems. What is the ideal debt ratio? Generally speaking, a ratio of 40% or less is better. Some companies are exceptions to this rule, such as utility companies or banks, but for small businesses and individuals, a low debt ratio is preferable. Do keep in mind that there are times you can use debt to your advantage and that you will often need to take on debt to make your business grow. After all, without investment, you are unlikely to make returns. Don’t take out more loans – or consult someone before you do! Refinance or pay off debts. If you have many loans that are accruing interest, consider refinancing them if it will lower the interest. You could also consider trying to pay off your debts sooner. Get a small business accountant. If you are uncertain of how to improve your debt ratio, sit down with a local accountant who will see the potential in your business. Debt ratio is one of the many key performance indicators (KPIs) you can use to measure how your small business is progressing. Although a good debt ratio is important, it’s not the only KPI you should use. There are times when you can use debt to grow your business. Getting help from London chartered accountants Tax Agility to tackle your financial management will help you understand where you’re heading, and what KPIs are relevant to your specific business model. As London accountants looking after small businesses and startups, we know how important it is to have someone just down the road who can see you face-to-face.